Listening, I learned much about the impacts different types of weapons have on places all around the world. I had never really thought about how big of an impact small arms and light weapons (SALW) have. I was so used to worrying about WMDs. But I heard governments repeatedly say how SALW are “the real weapons of mass destruction”, due to the amount of violence they cause every day. This is not to belittle the impact of other weapons, as I heard about the tension and violence they cause as well. But my eyes were opened to the devastation caused by the proliferation of guns around the world. While this all might sound depressing, I also gained an appreciation for how we do not have to accept the world as it is. 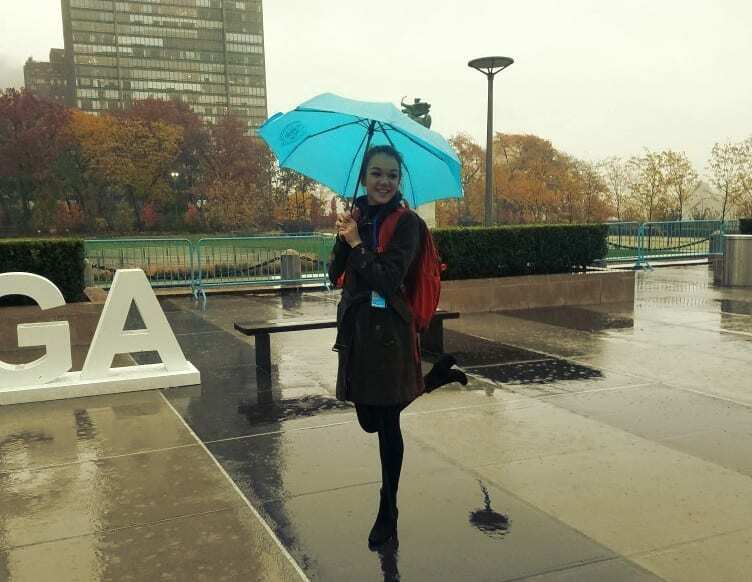 By going to the United Nations every week, I learned much about the disarmament policy process and international politics. Observing how member states use diplomacy to negotiate disarmament that works best for their country was especially interesting, because even though consensus is the goal, member states still must push for what they want. Even though there was some drama, I really believe that diplomacy is what is holding this world together, and that was shown to me in every meeting. Diplomacy has prevented and is preventing some of the most catastrophic events from happening. Even in the tensest moments, people were, for the most part, calm and collected. Even though the disarmament policy process can be frustrating and slow, it is so effective after decisions are finally made. I learned that while the bigger and louder member states may seem to dominate the conversation, disarmament policy is actually more about the smaller states and developing countries. They make up to majority in the General Assembly and are able to band together to work for the disarmament agenda in regards to their own development and sustainability. I also observed that civil society play a crucial role in international relations, particularly in regard to achieving sustainability, development and disarmament. The work that NGOs do to positively impact the international community is amazing, and I learned that many of the steps the UN has taken to improve peace was due to the involvement of advocates and activists. Besides learning about the world, I also learned much about myself. I have discovered I have a passion for disarmament, particularly SALW. I loved working with an international NGO would love to do so again in the future, particularly at the UN. I learned strategies for improving my focus and listening skills, as I had to be 100% attentive to make sure I did not miss anything being said for three straight hours of meetings! At first it was really difficult, but as time went on, it got easier, and I was able to catch more and more information. I am now trying to implement the ideas I heard discussed at the global level at a more local level. I have been encouraging students at Pace to do our part to implement the Sustainable Development Goals (SDGs). Through recycling more and using less water we can promote SDG 13 on Climate Action. Taking civic engagement classes like this one to work with charities we can work to end poverty (SDG 1), prevent hunger (SDG 2) and build sustainable cities and communities (SDG 11). We can also push for disarmament in our own communities — for example Pace University’s Take Action Against Gun Violence Campaign – to contribute to SDG 16 on peace and justice. After working with Control Arms, my outlook on disarmament as a whole has changed. Working with them was a very hopeful experience. I learned that a world free from the threat of weapons and violence is a completely achievable goal. It may not happen as soon as tomorrow. But through advocacy and diplomacy we can world for a more peaceful and secure world.